Ever since the social video market boomed through 2006, some video services have sought to differentiate themselves by adding online editors. Jumpcut and Motionbox launched their editors last April and Jumpcut was acquired by Yahoo! 5 months later. Eyespot launched its editor a month before Jumpcut, last March. Last December Gotuit launched their SceneMaker video mashup app. Photobucket recently coming launched its own video/audio/photo editor for premium members (full release next month). Today, Cuts is launching its editor into public beta. Here’s a look at each of the services, followed by a more in depth chart comparing features. Cuts is the new kid on the block and is all about remixing viral video. They don’t host content, but instead take videos from other sites (YouTube, Google, Myspace). With Cuts you can trim, loop, add preloaded sound effects, and insert captions to enhance the original. Editing is straightforward, consisting of changes to the sound, caption, and navigation levels for the video. Every edit can be re-cut, embedded, and emailed. In the future, Cuts will be expanding into simple editing for digital movies and TV shows. See also our early look at Cuts a few weeks ago. Gotuit Scenemaker is for slicing out scenes from videos on other networks. After importing a video into the program via URL, you can select a start and end for one or more scenes on the video, title, tag, and email the scenes to friends. Unfortunately I couldn’t use it to slice up Gotuit content. Eyespot is a solid editor that lets you mix together your own Motionbox content or scenes from their promotional media packs. It has a simple drag and drop interface that lets you manage a wide variety of effects and transitions for both the audio and video layers. Eyespot lets you add your own audio and mix in photos as well. While you can’t grab video from other networks, Eyespot’s white label editor is becoming available on more and more sites. The NBA is one of the most recent additions. 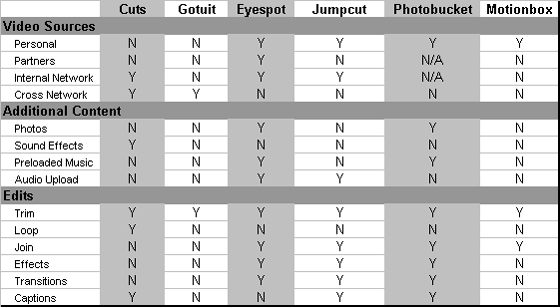 Jumpcut is the most developed of the editors, allowing you to add a long list of effects, transitions, and captions to the videos. It also incorporates fine grained control of trimming and audio levels (uploaded background audio and voice). The complexity of the interface makes it great for detailed edits and mashups, but borders on being too heavy an application for the internet. Photobucket just released a new video editing product that leverages the most recent Adobe Flash tools. Unlike any of the other services, users can “mash up” video clips with audio files and photos, and add effects and transitions.